There's a significant demand for the knobby boxes that add traditional controls to Roland's old digital parameter-access synths, and recent sales on eBay have included a PG200 (for the JX3P and MKS30) for £235$380, a PG300 (for the Alpha Juno series and MKS50) for £280$450, and a PG800 (for the JX8P, Super JX10 and MKS70) for no less than £485$785. Meanwhile, asking prices for the MKS80's dedicated programmer, the MPG80, have peaked at close to £1000$1600. These are crazy prizes for what are, if we're honest, just control panels for synths that would have had them in the first place had low cost not been a major design factor. So here's a thought: with modern technology, it should be possible to build a programmer that can substitute for all of these and address a bunch of other synths besides. And here it is. 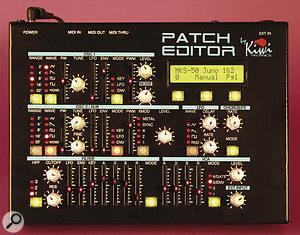 It's the Kiwi Technics Patch Editor. 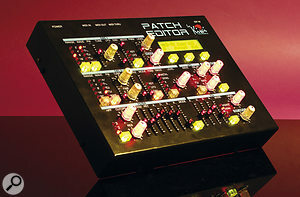 The Patch Editor (or 'PE') is a chunky piece of kit that looks like it should have been made by Roland in the 1980s, but wasn't. It feels robust, too — the pots are firm and smooth, the buttons are positive, and the faders, while not the most expensive, are fine. The most pleasant surprise comes, however, when you switch it on. All of the controls that have a function when you select a given synth are illuminated, while those not in use remain unlit. Some glow red, some green, and some flash, and the nature of the illumination at any given moment provides information about the status of each control. Let's face it, the Patch Editor looks gorgeous. Around the back, there are MIDI In, Out and Thru sockets, an input for an external controller (see 'Using The External Input' box) and an input for a 9V DC power supply that you have to provide yourself. I'm normally critical of the use of wall warts but, on a unit where size and cost are such overriding factors, I'm prepared to give the manufacturer the benefit of the doubt. It's also worth noting that, like the PG200, the PE has magnetic strips on its underside to secure it to steel cased synths. Nice touch! So which of Roland's dedicated controllers does the PE recreate? Strangely, none of them. The manufacturing style most obviously recalls the PG200, but the range of controls is closer to that of the PG800, and none of the vintage units (nor, therefore, the controls on the original synths) map precisely to its controls; some synths use a sub-set of the knobs and sliders available, while others with extensive facilities omit some of the less important parameters. This, then, explains the main purpose of the 16x2-character LED screen; for any given synth, it shows you the name of the control that you just moved (which may not be the name silk‑screened onto the panel) and its current value. Given its resemblance to the PG200, I started testing the PE by turning to my Roland JX3P and removing its dedicated programmer from the top panel. I found that the PE is somewhat larger than the Roland unit, but it still fits into the available space, so all was well. Initial setup was simple, with just five menu settings: the synthesizer that I wanted to control, the MIDI channel that I wanted to use for that choice, the incoming MIDI channel for any controller keyboard connected, the brightness of the PE's controls, and the parameter to be controlled by the external input. However, I was unable to proceed any further because the PE doesn't use the six‑pin DIN sockets used by the JX3P and the PG200; it only has standard MIDI sockets. Thankfully, the manual provides the pin‑out diagram to enable you to make a converter cable, so I spent an hour doing so, plugged the five‑pin MIDI Out of the PE into the six‑pin Programmer In on the JX3P, took a deep breath, switched on and... it all worked perfectly! If you have a JX3P but have never used it with a programmer, you've missed one of life's little pleasures. It's such a simple synth, but such a pig to program from its front panel. Yet it sounds lovely, and it comes alive when connected to a handful of knobs and switches. This was a good start. 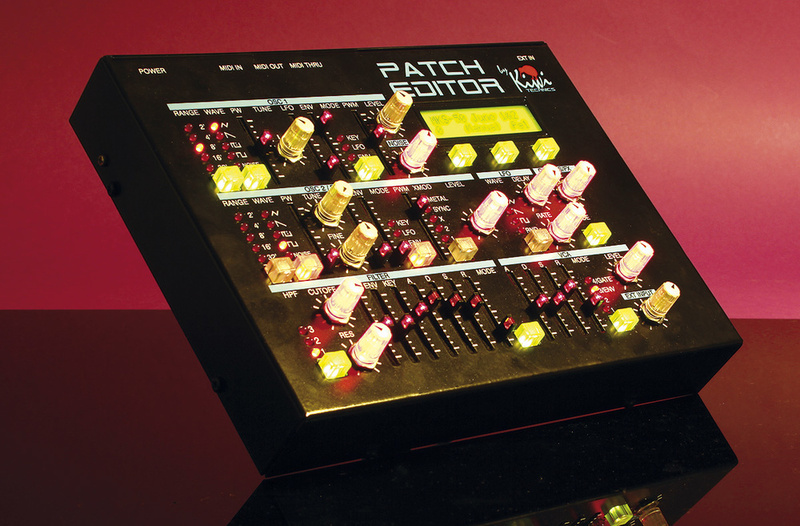 The Patch Editor's back panel features just a quarter‑inch input for an expression pedal, MIDI In, Out and Thru sockets, and a port for the 9V external power supply. Of course, the PE does much more than program the JX3P, and setting it up for use with other synths was even simpler because there was no need for special cables. I could simply plug my controller keyboard into the PE's MIDI In, and then direct its MIDI Out to the instruments that I wanted to control. Any incoming MIDI notes and performance data are interlaced with the programming data generated within the PE itself, so I could play and edit simultaneously, thus auditioning the results of my twiddles in real‑time. I set up a chain of four instruments: a Roland Alpha Juno 2, an MKS70 Super JX, an MKS80 Super Jupiter, and a Korg EX8000. I wanted to use the Juno 2 as the controller keyboard, so I connected its MIDI Out to the MIDI In of the PE, the MIDI Out of the PE back to the MIDI In of the Juno, and the MIDI Thru on the Juno to the chain of modules. No nasty MIDI loops occurred, and all worked as it should. Editing the Juno 2 itself worked well, because all of the synth's parameters were mapped to the PE, with the exception of one important area: two of the envelope parameters were permanently set to values that truncated the contour from five stages (AD1D2SR) to the more common four. This meant that the contour could be mapped to the ADSR sliders on the PE, but at the expense of one of the synth's best features. So I emailed Murray Hodge at Kiwi Technics, and 24 hours later a new version of the operating software arrived. This retained the ADSR compromise on the original setup, now called Page 1, but also offered the full set of seven contour parameters on a second page. This was much better. Editing the MKS70 from the PE again worked well, although there is one compromise in the parameter map that concerns me: the degree to which velocity affects how much the oscillators' pitches, the oscillator mix, the filter cutoff frequency and the VCA respond to their envelopes is the same for each. This means that if you want to create a patch in which the velocity affects the oscillator mix a little, the cutoff frequency a bit more and the amplifier a lot, you can't program it from the PE. What's more, the Key Follow options in Env1 and Env2 are not implemented. I feel another email to Murray Hodge coming on! Like the Juno 2 and MKS70, the MKS80 can also be programmed over MIDI, so it's not necessary to use the dedicated MPG80 input. And, as with the previous synths, the PE worked well with it. However, because of the size of the Super Jupiter's patch map, more compromises were required. For example, the modulation polarity of the two oscillators is always the same, and the Key Follow amounts for both Env1 and Env2 are missing from the patch map. Many of the performance controls are omitted too; if you want to program things such as the key mode, glide, the bender and aftertouch, you'll have to turn to the synth itself to do so. But if this makes me sound a bit negative about the PE, it's only because I have an MPG80. Had I been forced to program my MKS80 from its front panel, I would have sold it years ago. For anyone with an MKS80 but without Roland's dedicated programmer, the PE will be a godsend. Although not a Roland synth, setting up the PE for use with the Korg EX8000 was as simple as before, and worked as well as before. But, like the original Juno 2 page, the Korg's five‑stage ABDSR contours were initially curtailed to four‑stage contours. After a second email conversation with Kiwi Technics, another upgrade was forthcoming and, again, the revised version retained the ADSR profiles on page 1, but mapped the full six parameters to the controls on page 2. Nonetheless, as elsewhere, a few of the synth's lesser parameters still remained unaddressed. In this case, the auto‑bend parameters are not controlled, nor are those relating to aftertouch, the joystick or portamento. The controls on the Patch Editor's front panel only light up if they have a function on the selected synth model — very helpful. The PE also supports the Roland Juno 106, but this seems rather pointless given that it already sports a dedicated control per parameter. However, there's one module that uses the same synth engine as the Juno 106 but has no controls whatsoever: the MKS7 Super Quartet. Grabbing yet another MIDI cable, I connected mine and found that selecting the appropriate MIDI channel on the PE (1 = bass, 2 = melody, 3 = chord section) was all that was necessary to make it possible to edit each of the parts. Of course, neither the editor nor the module could store the results (neither has memories), but I have never edited my MKS7 before, and doing so proved to be an unexpected pleasure. One less obvious feature of the Patch Editor is its ability to translate MIDI Continuous Controllers to SysEx commands. Many software products and some hardware control surfaces send only MIDI CCs, and many synthesizers' programming systems respond only to SysEx. But, given that there's a standard MIDI CC map, it's possible for the PE to accept the incoming CCs and translate them into the appropriate SysEx commands for whichever synth is selected at the time. (Well, with the possible exception of the PG200 or PG800 options, which I didn't test.) There is, however, a caveat: SysEx uses more data than a MIDI CC for the same message, so there's a small risk of locking up the Patch Editor if you ask it to do too much at once. I didn't experience this, but I'm not a frenetic knob twiddler, so I am at less risk than some users. Another benefit of programming via SysEx is that each synthesizer responds only to its own data messages. To test this, I left my MKS80 and MKS7 in series, set the MKS80's MIDI channel to '1', and sent a bunch of CCs to the PE. As expected, I was able to edit each module independently by selecting the appropriate synthesizer in the PE's menu. Bravo! So what's the verdict? To be honest, I could continue digging out vintage synths and testing the PE with them, but I see no point, because every time I do so the result is the same. In short, it works extremely well, even though there are compromises that I would prefer to see addressed. But when you consider what it's like to edit these synths without any form of programmer... well, those compromises seem much less important. There are, of course, other ways to control knob‑less synths, including software editors, as well as programmable hardware controllers, but I'm not aware of any other unit that addresses so many synths in a quasi‑dedicated fashion, and offers so much control at any given time. If the PE has a shortcoming, it's the need to keep track of which control does what for any given synth. I asked Hodge whether he would produce overlays with the correct legends, but he said that they would be too expensive to be commercially viable. I think that he should reconsider. If I were to use the PE extensively, I would want these, because they would make the experience much more pleasant and more productive. It would also be nice to see Kiwi Technics supply the dedicated MIDI‑to‑PG series cables that some owners will need, but I accept that it may not be commercially viable to do so. Finally, we come to the issue of the price. At NZ$550 (which, at the time of writing, is £270 plus or minus a few quid$435), with shipping at NZ$80, plus import duty and VAT (if charged), you're looking at somewhere between £300 and £400$500 and $600 in total. This isn't pocket money, but it's considerably less than you might now pay for a PG800 alone. In fact, if you own more than one of the instruments that the PE programs, it's not very much at all for something that will inject new life into your revered old synths and modules. Because of the evolution of the Patch Editor during the course of this review, I upgraded its processor once and its software twice. Upgrading the hardware was straightforward because the chip is socketed; all that was required was the usual degree of care when disassembling and when handling sensitive chips. The software upgrades were even simpler. Kiwi Technics supplied two files on each occasion: a bootloader and the OS itself. I used SysEx Librarian on my MacBook Pro with a Tascam 428 as a USB‑to‑MIDI converter, and everything worked perfectly first time. The Patch Editor's external input allows you to use a conventional quarter‑inch TRS expression pedal to control one parameter of your choice, with the amount of deviation determined by the Ext Input knob. I found that a Roland EV5 pedal worked perfectly and, although this may seem a relatively trivial extension to any given synth's facilities, it can make a huge difference to how you use it. You can also connect a CV from a modular synth to this input, so if you fancy hooking up your polyphonic MIDI modules to your Moog System 55, you can now do so! Murray Hodge has developed a JX3P upgrade that offers six keyboard modes, full tuning capabilities for both oscillators, portamento, velocity and aftertouch sensitivity over MIDI, independent modulation levels for the oscillators, filter and amplifier, two LFOs with greater ranges and more waveforms, two contour generators, an arpeggiator, a chord mode, a pattern play mode, an increase to 64 editable patches, and more. Installation is not trivial (the original CPU must be desoldered and replaced with a socketed piggy‑back board) but it shouldn't take a competent engineer much more than a couple of hours to complete. A further upgrade option offers control over the synth's chorus effect, while a third makes the upgraded JX3P backward compatible with the PG200. I'm really looking forward to trying it when the final release version becomes available. Price: NZ$175 (approx £80) plus shipping. It breathes new life into otherwise impenetrable synths. It's a very cost-effective alternative to multiple, dedicated programmers. It feels chunky and robust. The response to customer feedback is first class. Some lesser parameters are omitted from many of the edit maps. No templates are available, so the panel names are not necessarily correct for a given edit map. Two of the options require non‑standard cables that are not supplied. It's no fun editing a digital parameter-access synth, and even if a dedicated programmer exists, it's likely to be expensive. 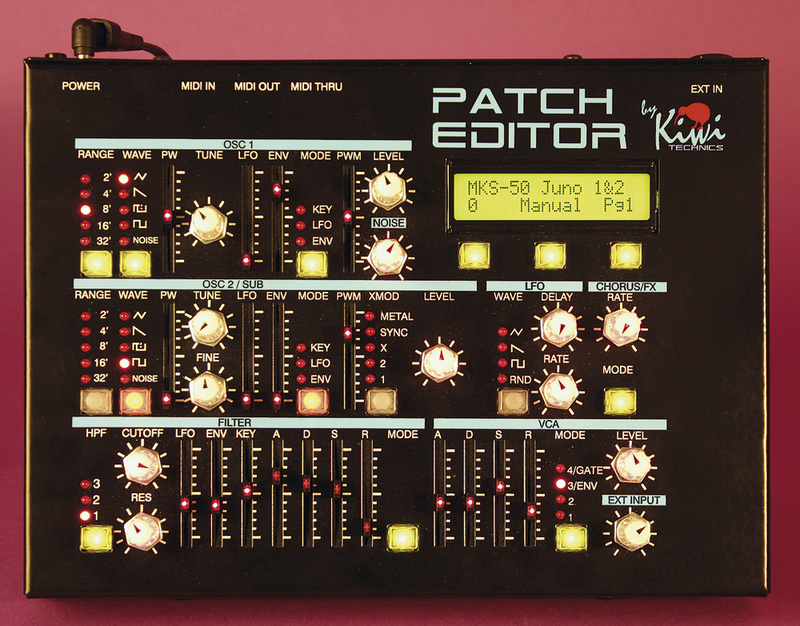 The Patch Editor already substitutes for four of Roland's dedicated programmers and also addresses vintage synths from Korg, Sequential, and others. It's a great idea and it deserves to be a success. NZ$550 plus NZ$80 for shipping. Kiwi Technics +64 9 4281900. NZ$550 + NZ$80 for shipping.